21 1ST READER (impatiently) "He was all that you say he was and greater than you...he sealed your lips with might and to the South he became a hero. You became a legend, symbolizing the futile fight for humanity. The victum and the victumize often bear a close resemblance. Booth was also moved by an inner voice...he also acted out of dictated of his heart. Both of you were cosmic actors, acting out your destinys'...if you believe as you say you do...The lost of the moth to the flame is not futile for he adds a speck of phosphorous to the world. It is our will that you return for you will polorize the prejudicial opposition into a choatic society. Anarchy will reign, and the people will thrust up a leader of superhuman proportions...to lead those genetically suited to lead...No more petty humaness, dependent on the inner echo, but men led by men with the distribution of wealth and health unimpeded by ideologies, for they shall not owe their lives to known parents with vested ethnic or clan interest. It was wrong that man was made from soil, for soil contaminated man into nationalities. His birthplace became sacred, totally out of proportion to the nature of the men who rise there." 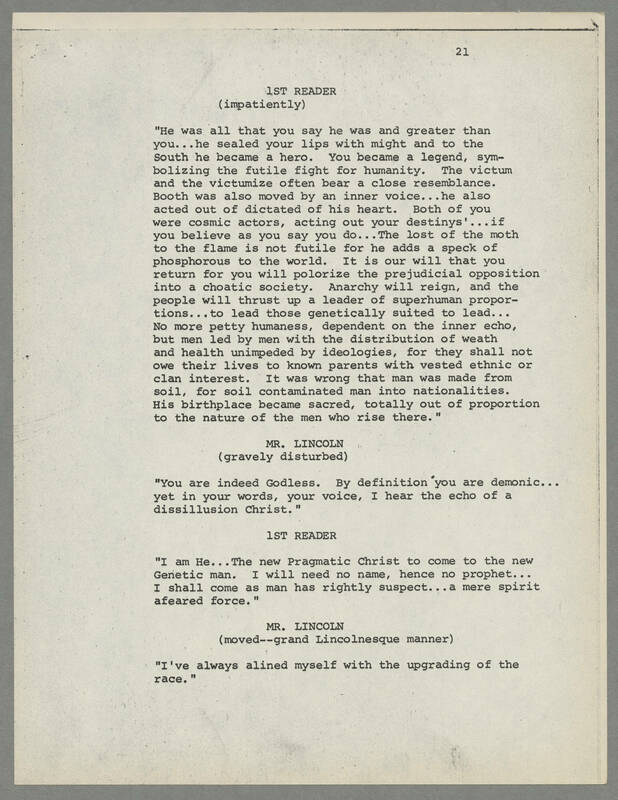 MR. LINCOLN (gravely disturbed) "You are indeed Godless. By definition you are demonic...yet in your words, your voice, I hear the echo of a dissillusion of Christ." 1ST READER "I am He...The new Pragmatic Christ to come to the Genetic man. I will need no name, hence no prophet...I shall come as man has rightly suspect...a mere spirit afeared force." MR. LINCOLN (moved--grand Lincolnesque manner) "I've always alined myself with the upgrading of the race."